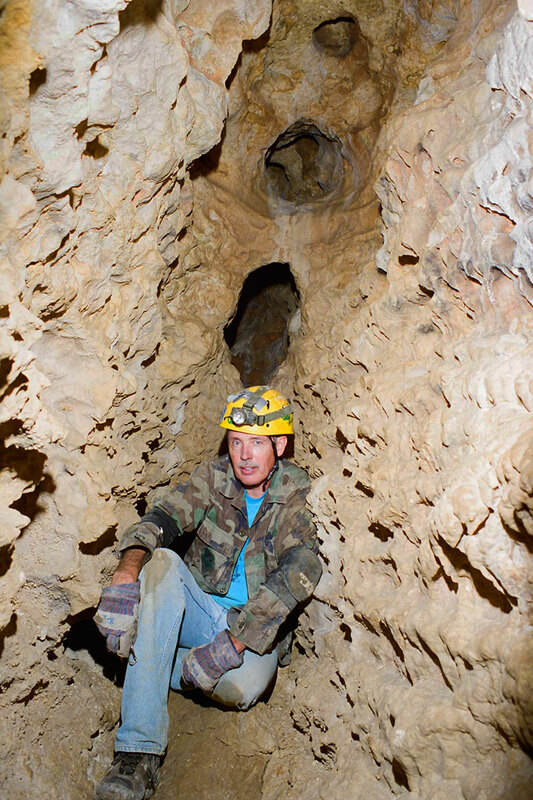 Robber Baron Cave has been the site of numerous scientific studies, and Texas Cave Management Association continues to promotes cave and karst research at Robber Baron Cave Preserve. Its location in a major metropolitan area with easy access makes it an ideal site for research. As a karst resource, it has unique geological features and biological species, including endangered species that are found nowhere else. 3D cave mapping prototypes (a partial 3D map of the cave has been done and printed in 3D). Biological studies, including identifying two endangered species. Edwards Aquifer studies, establishing a link between Robber Baron and the Edwards Aquifer. Tricolored bats in the entrance room of Robber Baron Cave. A large variety of species live in Robber Baron Cave, although most visitors might not notice them. The majority of the species in the cave are invertebrates, but in the last few years an increasing number of tricolored bats (Perimyotis subflavus) have been making the cave their home in the winter. 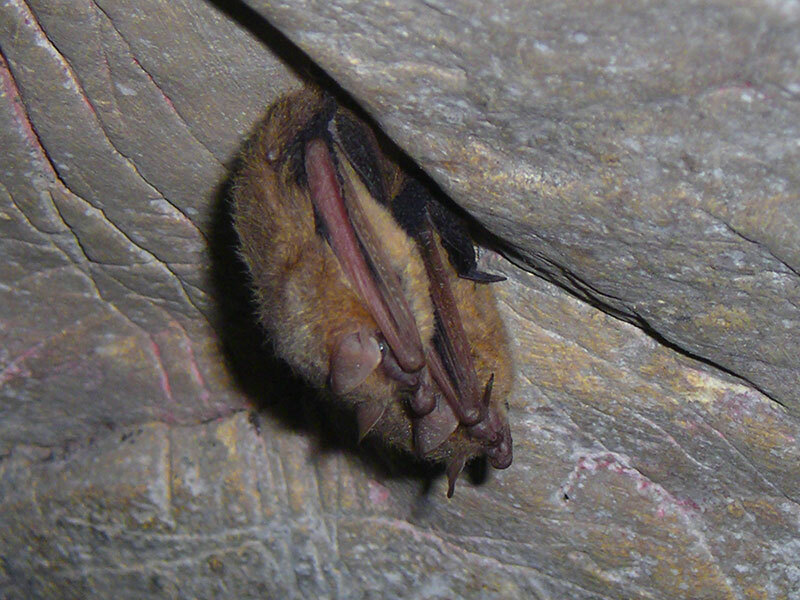 These bats use the cave for hibernation and are known to return to the exact same spot to hibernate year after year. These species can be largely divided into trogloxene, troglophile, and troglobite. A trogloxene enters a cave just for reasons of food, to escape summer heat, or to hibernate, but does not live there. A troglophile lives a portion of its life in a cave but also lives part of the time above ground. A troglobite, on the other hand, is so well adapted to the underground environment that it is only found in caves and does not survive well on the surface. Texella cokendolpheri (Robber Baron Cave Harvestman, also known as Cokendolpher Cave Harvestman). Both of these species have been observed only in Robber Baron Cave. They are very small in size, only a couple of millimeters, essentially eyeless, and mostly lacking in pigmentation. These species are well adapted to caves, having a low metabolism due to the lack of food, and long legs for efficient travel and to feel their surroundings. 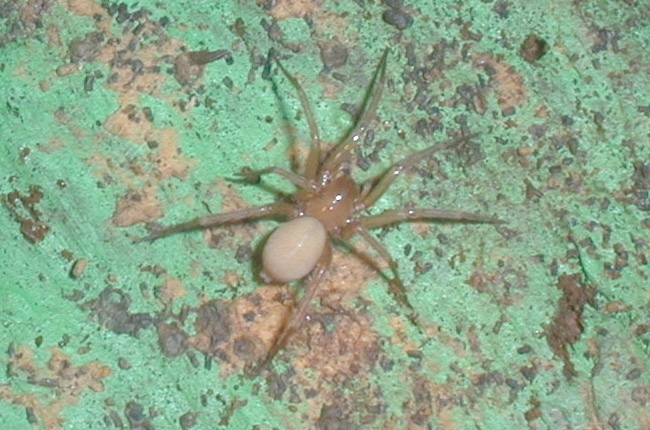 Robber Baron Cave Spider (Cicurina baronia). Photo by Dr. Jean Krejca. More information about endangered species in the Edwards Aquifer karst can be found here. Robber Baron Cave is a maze cave with a complex set of interconnected passages that generally intersect at right angles. The cave is found within the Austin Chalk formation, which underlies most of north-central Bexar County. The Austin Chalk is one of the upper confining layers of the Edwards Aquifer and in the location of the cave, is an upthrown fault block. It is a soluble formation, meaning that water flowing through small cracks can, over long stretches of time, dissolve the rock (in contrast to physical erosion). Austin Chalk is also relatively soft and rather clay-like (and less soluble) in its upper layers. Many features predicted by the hypogene speleogenesis theory are visible in this photo: cupola domes in the ceiling, narrow apertures, and slot-shaped passages. Photo by James Jasek. Robber Baron Cave maintains a near constant temperature of 71°F. Although this may sound pleasant, the relative humidity is near 100%, which leaves no place for sweat to evaporate. Airflow in this cave, as with most caves, is dependent on local barometric conditions. As air pressure falls (such as from a passing storm) the lower pressure outside will draw air out of the cave causing a breeze in passages toward the entrance. During periods of rising pressure, the reverse is true. Some small passages deep inside the cave also exhibit airflow indicating the presence of cave passages beyond that which are known. 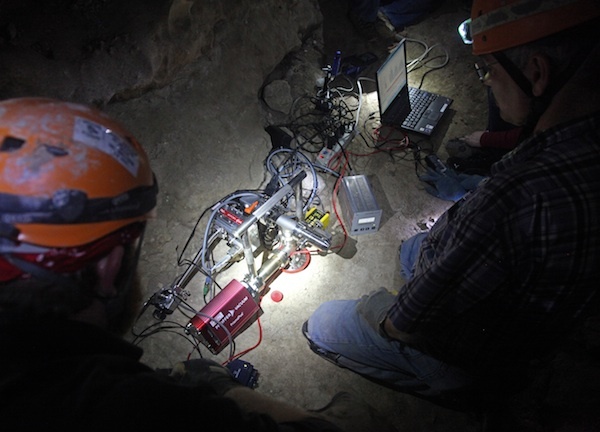 Scientists from Southwest Research Institute and St. Mary’s University used a portable mass spectrometer to analyze the atmosphere in Robber Baron Cave and several other central Texas caves. Photo by Larry Walther, courtesy of Southwest Research Institute. Veni, G., The Caves of Bexar County, Speleological Monographs 2, Texas Memorial Museum, University of Texas at Austin, p. 300, 1988. Palmer, A. N., “The Origin of Maze Caves“, NSS Bulletin, v37, n3, pp. 57–76, July 1975. Klimchouk, A., Hypogene Spelelogenesis: Hydrological and Morphogenetic Perspective, National Cave and Karst Research Institute, Special Paper No. 1, p. 106, 2007. Veni, G., “Hypogenic Origin of Robber Baron Cave: Implications on the Evolution and Management of the Edwards Aquifer, Central Texas, USA”, Advances in Hypogene Karst Studies, NCKRI Symposium 1, pp. 85-97. Mitchell, J. N. and E. J. Mitchell. “Airflow and CO2 in Robber Baron Cave”, Proceedings of the 15th International Congress on Speleology, Kerrville, Texas, v3, pp. 1613-1619, Jul 2009. Patrick., E. L. et al., “A Prototype mass spectrometer for in situ analysis of cave atmospheres“, Review of Scientific Instruments, v83, n10, Oct 2012.